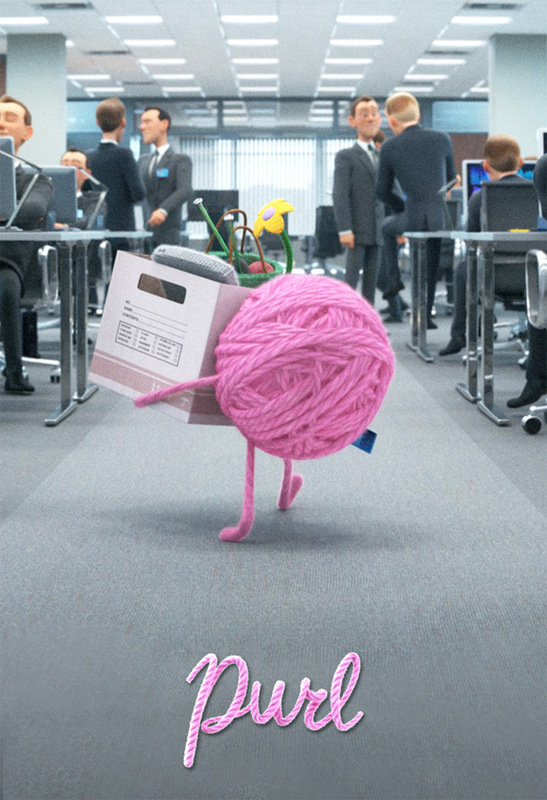 Short description from Pixar's YouTube: "Purl, directed by Kristen Lester and produced by Gillian Libbert-Duncan, features an earnest ball of yarn named Purl who gets a job in a fast-paced, high energy, bro-tastic start-up. Yarny hijinks ensue as she tries to fit in, but how far is she willing to go to get the acceptance she yearns for, and in the end, is it worth it?" Purl is directed by filmmaker Kristen Lester - she previously worked on "Sym-Bionic Titan" as an artist and as a storyboard artist for Blue Sky's Epic. The SparkShorts program is "designed to discover new storytellers, explore new storytelling techniques, and experiment with new production workflows. These [new] films are unlike anything we’ve ever done at Pixar, providing an opportunity to unlock the potential of individual artists and their inventive filmmaking approaches on a smaller scale than our normal fare." For more info, visit Pixar.com. To see more shorts click here. Thoughts?